Today I found myself showing friends from Kent around my home town, and inevitably I centred the visit on Walney beach as it was such a lovely sunny autumn day. The wind was a bit much for them however (poor things!) so after we’d inspected the rockpools we got in the car and headed right down to the South End, where the bird reserve is. 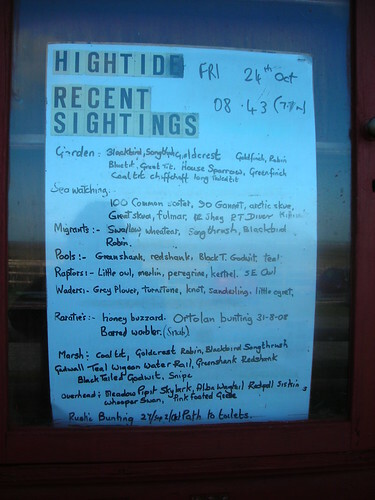 It’s a busy time for them, with the autumn migrations in full swing, so maybe that’s why the Recent Sightings bulletin isn’t at up-to-date as it might be. All the same, it’s a glorious (if elemental) place which feels like the end of all things. No wonder the travelling birds love to stop over. That is a fair amount!